Good morning prize-winners and parents, teachers and other guests. Firstly, congratulations on being the top-achievers at one of South Africa’s best schools. This is no small feat. While this is of course in part due to your own hard work and determination, I’m sure you will agree that part of your success is due to your parents and teachers. Girls, please join me and give them both a big round of applause. Today I want to speak to you about the Future and about “Unfinished Business”; the unfinished business of gender equality around the world, and the unfinished business of South Africa. Let me start with talking briefly about the ongoing struggle for gender equality around the world. When we look across the countries of the world we see that there are more girls in school than ever before in human history. Women are paid more than at any time in the past and there are also more women in leadership positions. Thankfully the voices and stories of women are starting to receive equal treatment to those of men, and most importantly, these stories are being told by women themselves and not by men on their behalf. Yet it is difficult to celebrate these achievements when women still make up the majority of the world’s unfed, unhealthy, unschooled and unpaid. In every country around the world women carry the lion’s share of the child-caring responsibility. While this is of course an immense privilege, it is one that should be chosen and not assumed. I trust that if and when you have children you will talk about this frankly with your partners – as a conversation among equals, not a forgone conclusion. Throughout the world women’s interests are underrepresented in society. As in all things it helps to look at those who are in the corridors of power around the world. Of the 195 independent countries in the world, less than 10% are led by women. Women hold just 20 percent of the seats in parliaments globally. So for every female parliamentarian there are 4 male parliamentarians. Less than 5% of the FORTUNE 500 companies have female CEOs. When we hear stats like this we need to ask how it is that women’s interests can be properly represented when there are so few women in positions of power? We still have ridiculous situations where national panels are deciding on women’s reproductive rights and access to contraception and the entire panel is made up of men?! To decide on issues relating to women’s bodies and women’s rights?! This is insane. Equalising opportunity between men and women is not only good for women, it is also good for men. We all benefit when our relative strengths are allowed to flourish unhindered. So this is the first point of my speech – gender equality is the great unfinished business of the 21st century and it turns to you and your futures to help finish it. The second thing I want to talk to you about is the future, but before I do I want to tell you a little bit about your school. 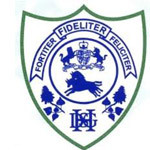 As I am sure you already know Durban Girls High School is one of the best performing schools in this province – you regularly achieve a 100% matric pass rate and a 97% bachelor pass rate. But I thought I would go and look at the data and see just how well you do in comparison to all the other public schools in the entire country. If we look at bachelor pass rates Girls High is not only in the top 1% of schools in South Africa, it is in the top 0.5% of schools. And if we only look at the 420 “large” schools – where there are more than 200 matriculants – Girls High comes second in the entire country. Congratulations! I would now like to move a little closer to home and focus on the role of women in South Africa and talk about unfinished business here in our own beautiful country. We have all heard about the amazing men that ushered in our South African miracle – a peaceful transition to democracy. Men like Oliver Tambo, Nelson Mandela and Ahmed Kathrada. But we have heard much less about people like Rahima Moosa, Lillian Ngoyi, and Helen Suzman. The women of South Africa played an incredible and often unacknowledged role in resisting and overturning apartheid. As early as 1912 Indian women in South Africa encouraged Black and Indian miners in Newcastle to strike against starvation wages, organising the first mass passive resistance campaign in the country. These impressive feats are often glossed over as we focus on male protagonists like Sisulu or Biko. Looking more broadly, it is important to remember that practically all of recorded human history was written by chauvinist men, side-lining the central role that women have played in nurturing and shaping the history of humanity. To give a gendered spin on Churchill’s famous quote “History is written by the victors” – or in this case, by men. One of the best examples of women’s involvement in resisting apartheid is the famous Women’s March which happened on the 9th of August in 1956 – the day we now commemorate with “Women’s Day”. 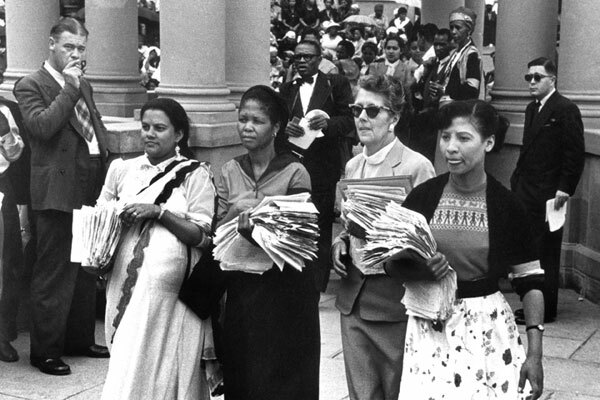 20,000 women marched to the seat of apartheid power – the Union Buildings in Pretoria – and presented a petition to Prime Minister Stijdom against the carrying of passes by women. This was one of the most impressive protests against the dreaded pass laws that were so characteristic of the apartheid state. Later, at Lillian Ngoyi’s suggestion, the huge crowds stood in absolute silence for a full hour. Before leaving the women sang ‘Nkosi sikeleli Afrika” and left with the dignity and defiance with which they came. Indeed, you strike a woman, you strike a rock! But now you might be asking “What does this have to do with me?” That was 1956, this is 2015! True. All of you were born in the democratic era of South Africa – the so-called “Born Frees.” (Personally I think this is quite a cheesy name with overtones of Bruce Springsteen, but whatever we’ll go with it). For those sitting in this hall, you live in a very different South Africa to that of the women in that Momen’s March in 1956. Whether black or white, male or female, gay or straight you have the exact same rights and privileges enshrined in our constitution. As I mentioned earlier almost all of you will go to university and be fortunate enough to pursue your passions and interests wherever they may lead you. But you are the exception. You are the 1%. 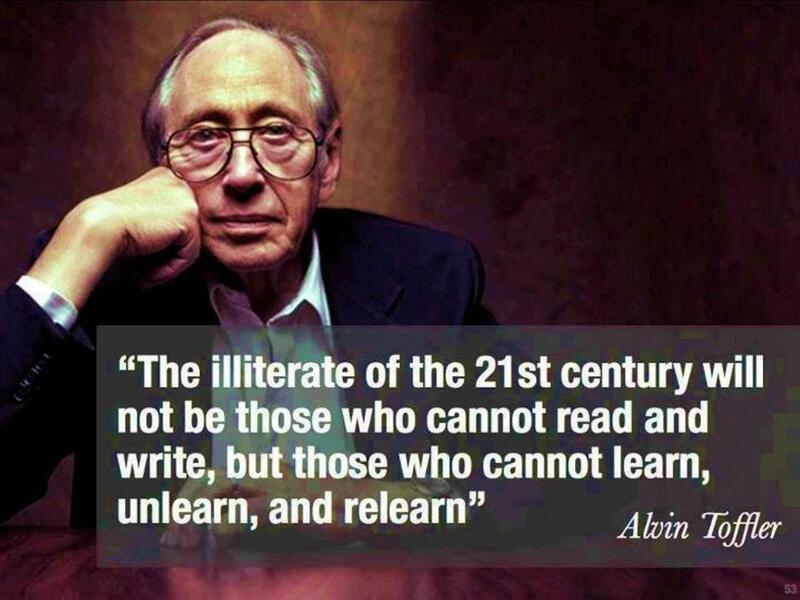 For most South Africans that is not the case and you can choose to do something about it. After 20 years of democratic rule most black children continue to receive an education that condemns them to the underclass of South African society, where poverty and unemployment are the norm, not the exception. This substandard education does not develop their capabilities or expand their economic opportunities, but instead denies them dignified employment and undermines their own sense of self- worth. While I was writing this speech I spent a long time thinking about how to convey the South African reality and eventually settled on two numbers from the research: R25 and R10. Today, on the 27th of February 2015 half the country lives on less than R25 per day. They are in abject poverty. With less than R25 per day they need to buy food, clothing, shelter, transport and all the other basic necessities needed to live free from deprivation. Half of South Africa lives on less than R25 a day per person. The second number is R10. 10million South Africans live on less than R10 per day. While I was writing this speech and thinking about this I just started crying. This level of poverty is what we call “extreme poverty” or “starvation poverty” or “malnourishment poverty”. The reason why this is called “malnourishment poverty” is because with less than R10 per day, you cannot buy the amount of calories needed not to be under-nourished, even if you spent your entire income on food. You would still be undernourished. 10 million South Africans live on less than R10/day. Whenever you see a R10 note remember – 10 million South Africans live on less than R10 a day. I don’t tell you about these stats to bring a downer to your prize giving. I tell you about them to implore you to do something about it. Whatever your background – rich or poor – you have been given one of the greatest opportunities in life – an excellent education. You will qualify to go to university and allow for the free unfolding of your personality, gifts and talents. As you make your way in the world you will have many choices before you. What do I want to do with my life? Who do I want to be? What should I study? And I want to suggest to you today that you will only find true meaning in your life when you live it for the benefit of others. You were not born in a random country at a random time. You were born in South Africa only a few years into democracy. Born into a beautiful country of hope and potential but one that is also still riven with racial tensions and inequality. A country still trying to make peace with itself and with the wrongs of the past. This is the unfinished business of South Africa and it falls to us, the youth of the country to keep fighting. To fight for the rights of those who cannot fight for themselves. For the millions of poor and marginalized South Africans who live on the outskirts of society – unseen and neglected. I will tell you how we fix this country. It is not by relying on corrupt politicians whose greed and envy cloud their judgment and choices. It is not by bitching and complaining or packing for Perth. It is not by building higher walls or buying bigger cars. The way we will fix this country is when competent, ethical and ambitious young women and men decide to be part of the solution at whatever personal or professional cost. When passionate people like you and me decide that we want to work in government schools and public hospitals not because it is our last resort but because it is our first responsibility – to use the opportunities we have received for the benefit of others. So, in closing, it is my hope today, that sitting in this hall, there are those who will use their talents, energies and ambitions to finish the unfinished business of South Africa. That here amongst us are some Rahima Moosa’s or Helen Suzman’s or Lillian Ngoyi’s, who can speak truth to power. Who can fight for the marginalised and oppressed. And who can show to all the world that when you strike a woman you strike a rock. In writing this speech I have taken statistics and phrases from a variety of different places including Sheryl Sandberg’s “Lean In”, Angus Deaton’s “The Great Escape”, a number of articles on SA History online, and various speeches of Hillary Clinton.